Small with a big personality is how 5-year-old Dexter is described by caretakers at the Champaign County Animal Welfare League, where potential adopters can get to know him. 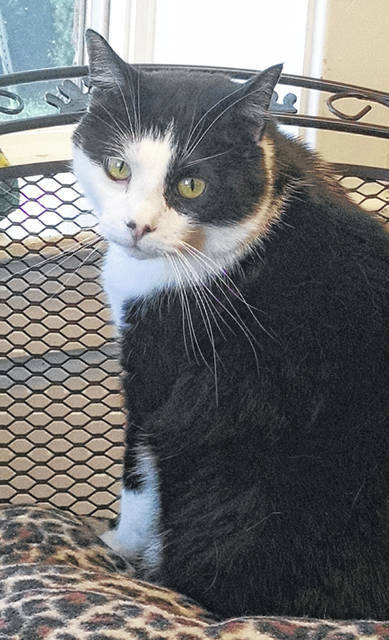 Domino, age 5, is so friendly to everyone that he’s considered the office manager at PAWS Animal Shelter, where you can visit to see whether he may be fit right in with your household. At age 8, Lucie is one of Barely Used Pets’ senior dogs, and so is featured during this Adopt a Senior Dog Month. She enjoys walking on a leash. November is Adopt a Senior Dog Month. Lucie is one of our seniors. 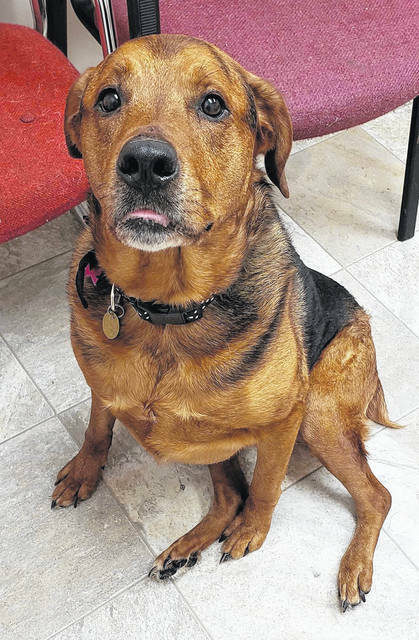 She is an 8-year-old Rottweiler Shepherd mix. A kind-hearted person took her in, but her 2 young German Shepherds were too much for her. She is a kind, quiet old soul. She walks well on a leash, is house-trained, spayed and loves kids. She didn’t appear to have any health problems when checked by our vet. She is up to date on shots and heartworm-free. In honor of Senior Month Lucie ‘s adoption fee is $125. We also offer Lucie in our Senior to Senior program. Please meet Domino, who has been at the shelter since February of 2016 and has found himself in the position of office manager. He shares the office with the shelter manager. He is just as handsome as can be and is friendly to everyone he meets. He’s 5 years old and would do well in just about any home. He loves to bird-watch out the windows. He does have a special food for urinary care that his new owners will need to be aware of. Just call the shelter and they’ll tell you all about it. Domino is neutered and up to date on all of his vaccines. Please stop by the shelter and meet him today! – Photos with Santa at PAWS – Dec. 1 from noon to 3 p.m. Minimum $5 donation requested. PAWS is located at 1535 W. U.S. Route 36, just west of Urbana. Contact PAWS at 937-653-6233 or pawsurbana@hotmail.com for information about volunteer opportunities and donation needs. Hours are Tuesday thru Friday noon to 5 p.m. and Saturday noon to 4 p.m. All PAWS cats and kittens may be found on Petfinder.com. 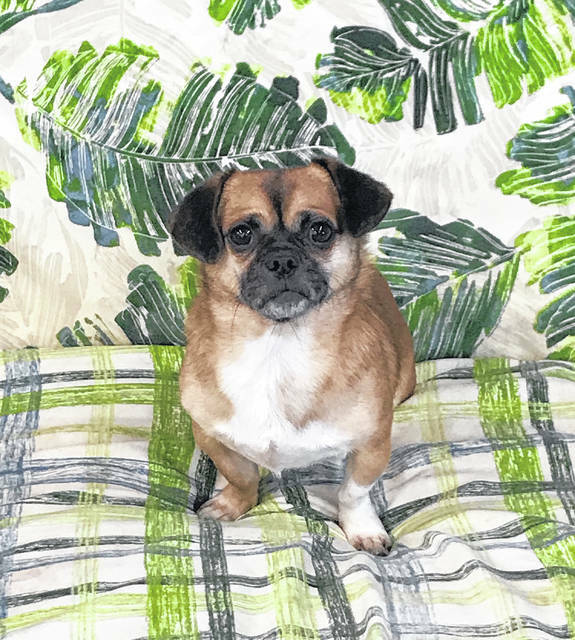 The Champaign County Animal Welfare League (CCAWL) Pet of the Week is Dexter, a 5-year-old Pekingese/Chihuahua mix who came to us as an owner surrender. Dexter may be small, but he has a big personality. Dexter is dog friendly, but hasn’t been cat tested and we can do that if needed. He is spunky, playful and loving once he gets to know you. However, he would do best in a home with no small children. Dexter is house-trained, neutered, microchipped and current on vaccinations: Da2PPL, Bordetella, Bivalent Flu and Rabies. Dexter has been tested negative for heartworm and has been dewormed as well as current on flea and heartworm prevention. If you would like Dexter to be a part of your family, you must have an approved application, which can be found on our webpage https://www.champaigncoanimalwelfareleague.com/ccawl-residents or pick one up at our facility during business hours. For all of our other canine listings, you may check out adoptapet.com and petfinder.com. The Animal Welfare League is located at 3858 state Route 56, Mechanicsburg, OH 43044. Fall-winter hours are 10 a.m.-4 p.m. Saturdays; closed Sundays and Mondays; 10 a.m.-2 p.m. Tuesdays; 10 a.m.-5 p.m. Wednesdays; and 11 a.m.-5 p.m. Thursdays and Fridays. 2019 memberships are available. These memberships will let you have access to our campus, which includes indoor/outdoor dog park, 72 acres of trails, grooming facility, agility course and much more. You must have current vaccination records before entering with your dog. For more information please call 937-834-5236. The Pizza Alley in Mechanicsburg will donate 5 percent of all sales to the Champaign Co. Animal Welfare League. The CCAWL was created to establish and operate an animal preserve, pet cemetery, dog training facility and rehabilitation home for unwanted pets. The CCAWL also provides a low cost Spay & Neuter Clinic that is open to the public. Come during business hours to pre-pay and fill out a surgery information paper and release form. At that time, you will be scheduled for a surgery date. The CCAWL only accepts cash, creditor debit cards. Please be sure to thank restaurants for their support. https://www.urbanacitizen.com/wp-content/uploads/sites/36/2018/11/web1_LeagueDog-3.jpegSmall with a big personality is how 5-year-old Dexter is described by caretakers at the Champaign County Animal Welfare League, where potential adopters can get to know him. https://www.urbanacitizen.com/wp-content/uploads/sites/36/2018/11/web1_PawsCat-3.jpgDomino, age 5, is so friendly to everyone that he’s considered the office manager at PAWS Animal Shelter, where you can visit to see whether he may be fit right in with your household. https://www.urbanacitizen.com/wp-content/uploads/sites/36/2018/11/web1_BarelyDog-1.jpgAt age 8, Lucie is one of Barely Used Pets’ senior dogs, and so is featured during this Adopt a Senior Dog Month. She enjoys walking on a leash.